All I have to say is: Bacon. Jam. Infused. Vodka. I could really stop there, but since we’re chatting bloody marys, I’ll elaborate. 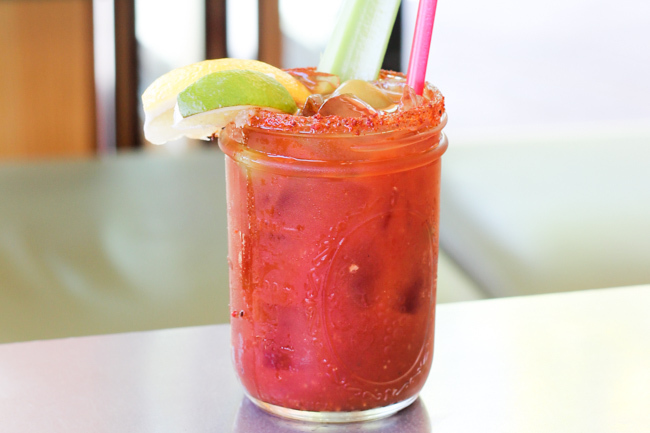 The light consistency and slightly smoky flavor make this bloody mary sultry, savory, and melded throughout. In other words, the bacon doesn’t slap you in the face with a 700 lb hog. Rather, it lingers around each expanse of your salivating mouth, delivering juicy, luscious heat. A final touch of bacon salt rimmer make this bloody mary a delicious cocktail of bacon perfection.